The Basenji has a very feisty, yet cat-like temperament. It is extremely clever, curious and independent, yet reserved. It also is very stubborn at times as well. It’s very obvious that this breed is a hunting breed because it loves to chase almost everything and anything. It needs to be stimulated, mentally and physically on a daily basis. If it is not, it can become disruptive from frustration causing it to destroy things in its path, or in your home. A Basenji does not bark very often, but if necessary it may let one out. Its bark sounds more so like a shriek that is a short, quick howl. Its bark is called “fox bark” because it resembles the bark of a fox rather than a regular dog. When socializing with other dogs, the Basenji can get along just fine. 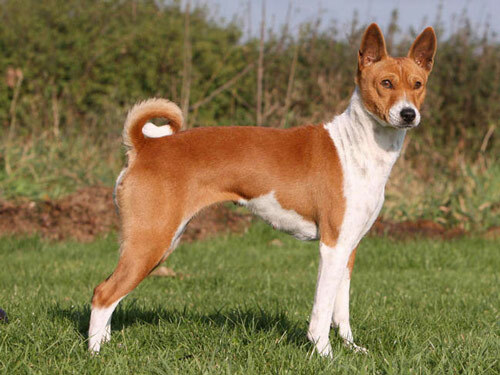 However, if you have two Basenji’s together, it is possible that it will become territorial and react poorly. Physical exercise is a must for most breeds, especially the Basenji. This dog, with its profound developing mind, also needs to be mentally exercised every single day. Long walks through the woods or somewhere outdoors are great for Basenji’s because they get their exercise and also have the option of exploring the trail you take. This keeps their mind and body on point. Being able to access the indoors is very beneficial to this breed. The coat of a Basenji is shorter and does not require much attention. The only grooming you will need to do is brushing your Basenji to remove dead hair. It is very unlikely that the Basenji’s coat gets matted or knotted. The development of Progressive Retinal Atrophy is a concern with this breed. It is important to monitor your dog to ensure that if he shows any signs of eye irritation, that he be taken to the vet immediately. Another major concern is Fanconi Syndrome. This typically will set in between year 3 to year 11 of your Basenji’s life. If you notice that your dog’s coat becomes poor looking, has a sudden weight loss, or noticeable weakness in your dog, then its very possible it is developing Fanconi Syndrome and should be checked out immediately by your family vet. Persistent Pupillary Membrane, PK, hypothyroidism, and umbilical hernias are also minor concerns found in this breed. It is important to get your dog tested on a regular basis, yearly to ensure that they are staying healthy. A healthy Basenji can live from 12 to 14 years. In their early years, Basenjis were often named after the tribe that adopted them. For instance, if the Congo’s found them, they were called “Congo Terriers.” They were initially used as herd hunters, to drive hunted game into nets. In the early 1800s and 1900s they tried to bring the dogs to England, but due to distemper, this was unsuccessful. The name Basenji literally means “bush thing.” In the 1950s, Basenjis became extremely popular as a direct result of a book that turned into a movie, featuring a Basenji. Their current ranking in the AKC is 79.